My laptop (Latitude E7470) was not working and eventually turned out the drive was corrupted. Dell get the new drive installed but now I would like to recover my data on the old one. Is there any way I can use USB adaptor to connect the SSD driver to a computer to read data? Or any other cheap solutions? - Get an M.2 to USB enclosure. - Get an M.2 to "regular" SATA adapter board, plus a SATA to USB adapter. 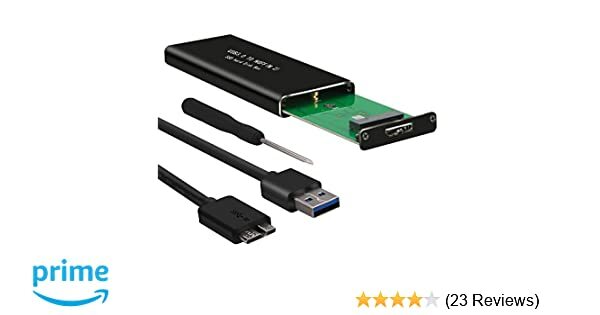 This option is probably a bit more expensive since you're buying two things, but the SATA to USB adapter is a handy gadget to have if you ever need to grab data off a hard drive or SSD that uses a normal SATA connector. Would you be able to send me the link for any of these options? Possibly links to ebay/amazon? The link above is the right type of product, although I don’t know about that specific unit. I have a StarTech SATA to USB adapter, and StarTech also makes M.2 to SATA adapter boards. That’s the route I would take for more flexibility, but as I said that’s more expensive.